Come and experience the adventure of Silverton Powdercats (formerly El Diablo Snowcat, same owners, same terrain, different name) guided Alpine tours atop legendary Molas Pass. Located seven miles above Silverton, Colorado and nestled in the heart of the magnificent San Juan Mountains, Silverton Powdercats offers a true alpine experience. We cater to the up-and-coming powder hound, looking to hone in their backcountry skills, as well as the advanced rider looking to be challenged. Our vast terrain includes chutes, trees and open bowls, much of which is above tree-line and reaching up to 12,500 feet. Throw caution to the wind...come play with Silverton Powdercats. Silverton Powdercats is owned and operated by Todd Brodbeck and Jon Krueger, two individuals with over 40 years of backcountry experience. Let our knowledge and dedication to the powder skiing and boarding cause, ensure a safe and adventurous experience for you. 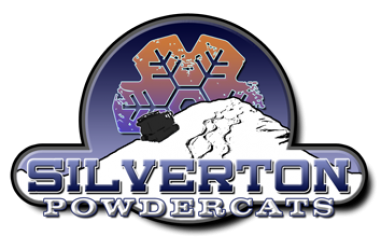 Silverton Powdercats' snowcats are powerful and dynamic Piston Bully's made for climbing in San Juan Mountains. Our enclosed cabs are warm and insulated assuring our guests a comfortable, quiet ride.